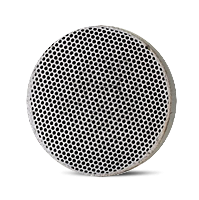 Pelonis Technologies’ innovative heating disc is made from a revolutionary ceramic material with over 1,200 holes that heat 100% of the airflow across the entire surface area of the disc. This creates a superior heat transfer in a small space, producing an instant flow of heat up to 50% hotter than conventional coil or ceramic chip heaters. Each compact honeycomb PTC heating disc provides a quick and efficient source of heat. Its advanced thermoelectric properties are based on an innovative extrusion technology that allow each disc to operate at high airflow temperatures but below the combustion point of most materials. 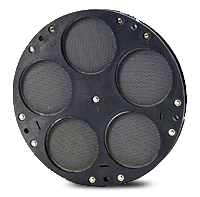 Honeycomb PTC heating elements can be configured into three, four, or five disc configurations that produce up to 2000 watts of heat output. Other OEM configurations are possible depending on customer applications. All PTC heater assemblies consist of high temperature PPS plastic, stainless steel contacts, and protective coatings for optimum conductivity.